Two bombs go off near Jolo cathedral killing at least 27 people Jolo and injured 111 people according to latest reports. 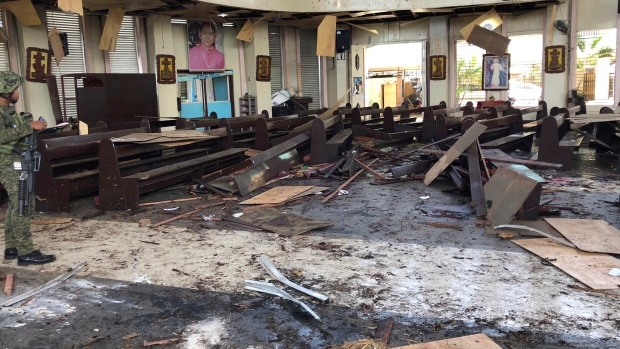 The blast occurred this Sunday morning at the Catholic cathedral in Jolo, an island near Mindanao. The first blast happened at 8.45 am, as Sunday Mass was underway, in the Church of Our Lady of Mount Carmel, which had been targeted in the past. A second device was detonated in the nearby parking lot. As the military sealed off the area, the injured were taken to hospitals with some airlifted to Zamboanga. Expressing his "firmest reproach" for a terrorist attack perpetrated on the Cathedral of Jolo in the Philippines while the Eucharist was being celebrated, Pope Francis prayed the Lord to “convert the hearts of the violent and grant the inhabitants of that region a peaceful coexistence”.